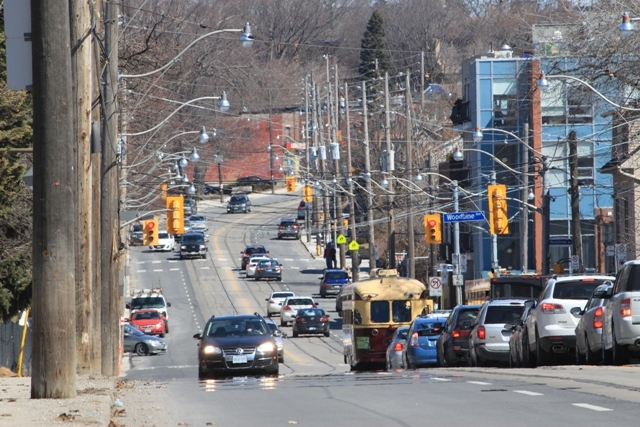 Turning west-to-northeast from Queen Street onto Kingston Road. Approaching Bingham Loop eastbound at Kingswood Road. At Bingham Loop. At each end of the trip there were many would-be riders and photographers. Our operator joked about setting new records for passenger loads on a PCC, although I overheard someone on the Coxwell bus remark that “I can ride a crowded streetcar any day”. 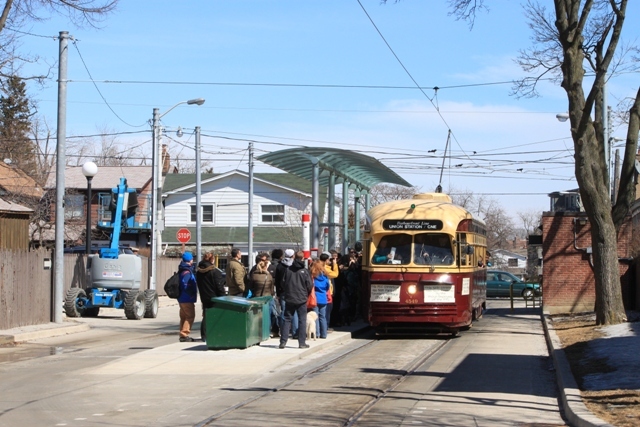 It was certainly a popular event with many children who had never seen a streetcar this old. Turning west onto Kingston Road from Bingham Avenue. Turning into Woodbine Loop from the east. I’m guessing that the TTC has still not “officially” taken ownership of any of the new low-floor Bombardier Flexity Outlook streetcars. 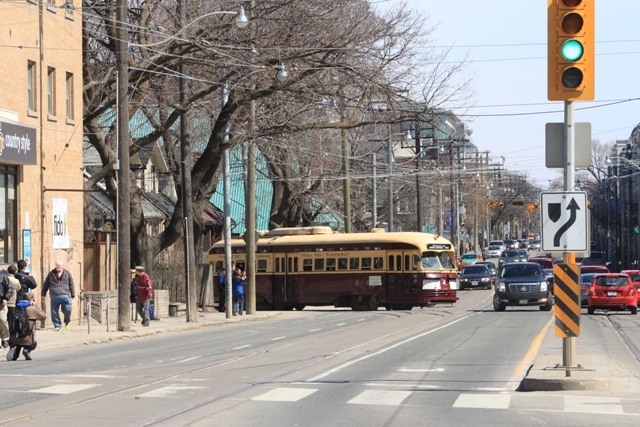 Would be nice to see a “parade” of different vintages of streetcars. 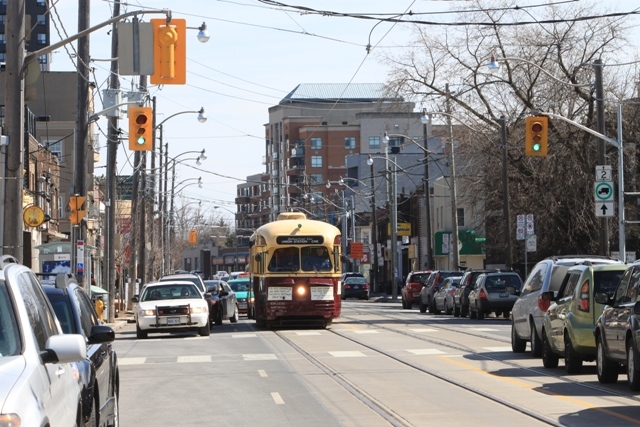 Could the TTC just send the LFLRV for a test run on Kingston on the day in question? They wouldn’t be able to carry passengers but there is all that new track and overhead that needs to be tested for compatibility. I suppose the biggest problem would be if they were running the LFLRV under “testing” it might be too slow for the PCC ‘Red Rockets’. 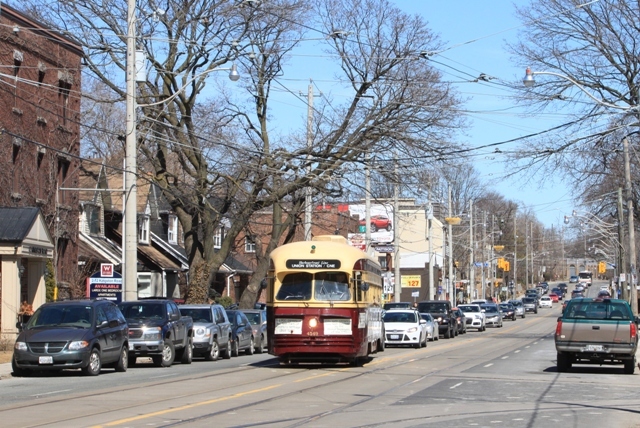 Steve: A nice idea, but even better will be the Beaches Easter Parade when there is usually one of every type of car out on Queen Street. A better question is why isn’t Bombardier jumping at the chance for free advertising. 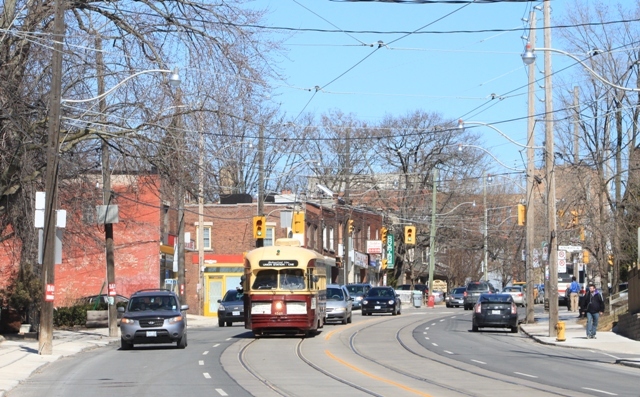 Steve: Of course, the TTC will have to explain why the new cars won’t actually run on Kingston Road for about four years. Not exactly a high priority route. Here is a link to photos of the special PCC excursion on Kingston Road. Is there anything on the rollsign that isn’t CNE/Union? I always find it strange that if the PCC is out for one reason or another, the destinations are way off! Steve: That isn’t a roll sign. It’s a permanent sign that was inserted in front of the rollers which had gotten in rather poor shape. The sign is intended for the summer Sunday service on Harbourfront that has not run for a while thanks to construction. There is still a route number roll in the side sign box, but what we really need is route names, not numbers. I suspect that the TTC will have to talk nicely to the fans or the OERHA to see if there are any spare PCC-sized roll signs of appropriate vintage. What is almost impossible to come by are pre-subway signs that don’t have destinations like “Dundas West Station” because with the PCCs all in service through the subway era, their linens tended to be updated. I have Peter Witt signs from cars that were scrapped when the Yonge subway opened, but their rollers are too wide for PCCs. I have a route linen from an Air Electric, but the first two route exposures, especially FORT, are not in good shape, suffering from what look like lightbulb burns. If these still work, then why are they not brought back to address the streetcar shortage until the new streetcars are rolled into service? Steve: There are only two PCCs, and they are maintained to a point of being reliable for summer tour service, not for day-to-day operation. Skills to operate and maintain these cars are not widely shared, and spare parts are hard to come by. Steve, how come you did not post pictures of the inside? Did you not ride it on Sunday? Steve: I was on the last trip which was packed. Exteriors show the community through which the line runs. 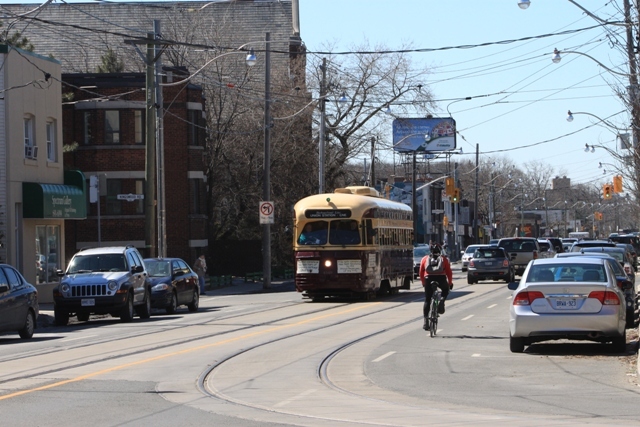 Vintage streetcars will not solve Toronto’s transportation problems. So can we suppress these types of posts. I’m not at all familiar with that stretch of town, but if the entire street, sidewalk, etc was being redone, was there any consideration to widening/adding bike lanes? Would that have been possible on that street? Steve: Widening was out of the question as this is a standard 66-foot right-of-way with houses and stores built to the lot line in many places. There is also parking everywhere, and carving out a bike lane was not possible. Forgive me for the incorrect terminology but let’s call the high GO train or subway like rails as Type A and low streetcar type rails as Type B. Of course, heavy trains can use Type B at at-grade crossings and streetcars can use Type A like in tunnels or on The Queensway. My question is what is the real difference between the two (other than Type B necessary at at-grade crossings and in mixed traffic)? It seems that the 501 is very fast on The Queensway compared to The St Clair or Spadina cars which too have their right of ways and could be the track difference as mentioned above. In other words, does Type A allow for faster speeds? Also why are The St Clair tracks so badly curved throughout the whole route? NO OTHER TRACKS anywhere in the world (and I have been to a lot of places) or at least as far as I know have such strange set of tracks. And no the street/sidewalk doesn’t curve as badly as the tracks. These frequent and relentless curves throughout the whole route may be why The St Clair car moves very slowly even within it’s own right of way. Steve: The Queensway has always had fast operation, and indeed was quicker before the institution of mandatory slow operation through intersections and the installation of “transit priority” signalling. Notable about this stretch of track is the absence of pedestrians and the relatively few cross-streets. St. Clair has stops that are closer together and a lot of j-walkers. As for the meandering track, the reason for this is that collectively the track and the safety islands take up not quite three lanes of road width. However, the track has to shift back and forth depending on the location of westbound and eastbound islands. 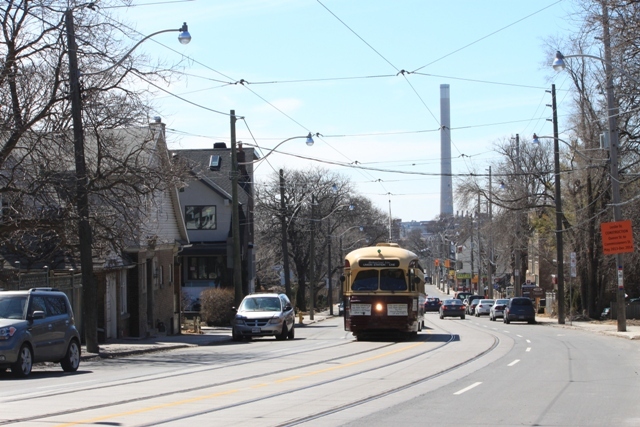 Yes, there used to be islands on the old St. Clair line too, but they were narrower, and also the designers did not give away an extra metre in right-of-way width to the use of centre poles. 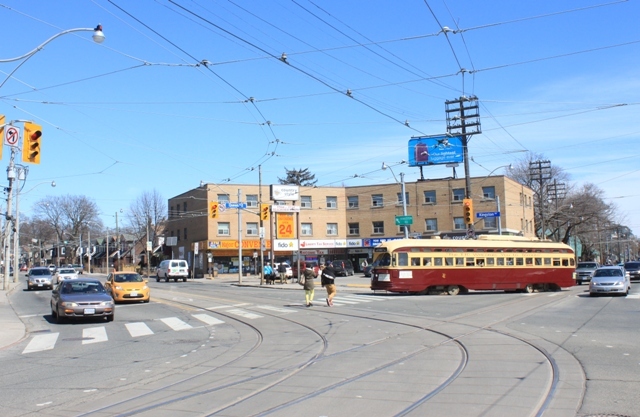 Little prevents streetcars from running at higher speed on St. Clair (and they do so at times) than the need to avoid running down the pedestrians. Is it at all possible that the April 1st ‘can we suppress’ post from RobInNorthToronto was an April Fool joke? Steve: Not when it is timestamped 9:28 pm. Steve, I’m hoping RobInNorthToronto’s comment was an April Fools’ Day prank, not made in dour earnestness. Steve: The timestamp is 9:28 pm, long after the noon cutoff. I took it seriously. I, and I’m sure most everyone else reading this, thank you for sharing that lovely spring day with us. It would be great to see the Peter Witt car brought out for such occasions, too, now and then, as well as the PCCs. Must have been a great, smooth ride on that beautiful new track. Go to Milan Italy. They have recently outshopped 1928 Peter Witts running all service on about 5 lines. It is strange to see Witts with LED turn signals and PA systems, but no heat. It would be great to see the Peter Witt car brought out for such occasions, too, now and then, as well as the PCCs. Go to Milan Italy. They have recently outshopped 1928 Peter Witts running all service on about 5 lines. Milan is Valhalla for Peter Witt fans. Here are some Peter Witt photos I took in 2009 along Milan line 2 between Piazza della Repubblica and Piazza Del Duomo. In Italian the Peter Witts are also known as the “Ventotto” (“28” as the model was introduced in 1928) or the “vettura a carrelli” (literally “car with bogies”). There is also a regular running Peter Witt on the great Market Street line in San Francisco. So, since the TTC supposedly thoroughly restored its one remaining Peter Witt car, why don’t they bring it out on these special occasions? Is there no one on TTC’s staff who knows how to run it? Thanks to everyone who mentioned the Peter Witts still running in Milan and San Francisco. Steve: It comes out only for very special occasions like parades and rarely carries passengers, certainly not the kind of loads that were on 4549 on Kingston Road. I’ve been informed it is due to the lack of brakes that they won’t use the Peter Witts with passengers. All modern cars have both the standard brakes plus track brakes as a separate system, and the PCCs are in this group. But apparently the Peter Witts do not have track brakes, and it would be too difficult to install such a system. 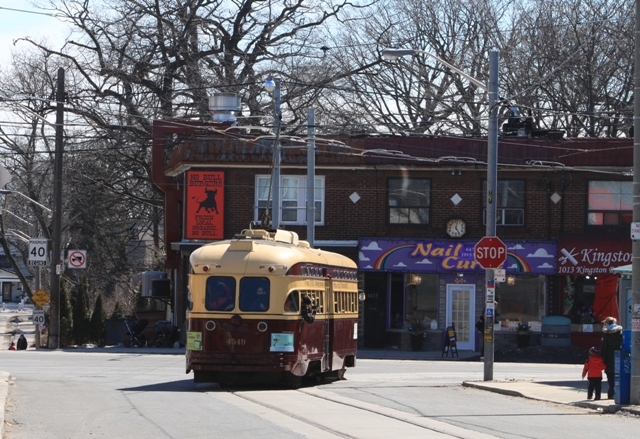 Several years ago I was told that the Peter Witt always travels in the middle of a convoy so that if the brakes don’t work the Witt will be stopped by a collision with the preceding car (or following, if it is a problem on a hill), and be stopped before it can hit something not owned by the TTC. Unfortunately I was not able to make it out on the day for the trip. So, thank you Steve for sharing the wonderful pictures of my favourite streetcar. 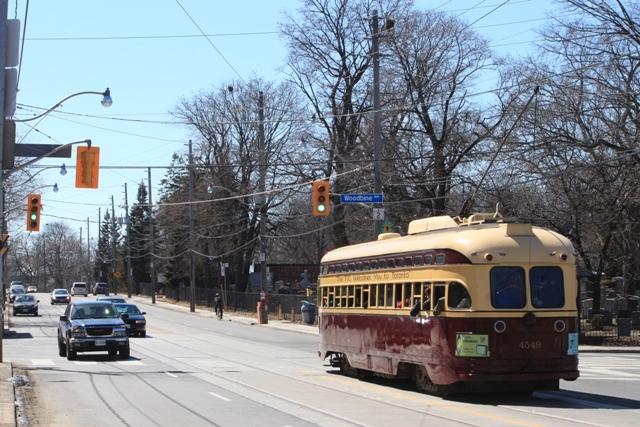 Very curious about the Toronto Peter Witt car’s inadequate brakes – how did the TTC manage to live with these cars during the many years they were the mainstay of the streetcar system? Were the Peter Witts notorious for runaways and other accidents caused by failed brakes? Or is it that this particular last remaining car has idiosyncratic problems with its brakes that no one has been able to figure out or remedy? Steve: The ever safety conscious TTC worries that the old car won’t be able to stop quickly enough in an emergency, and also that if the air brakes fail, the backup systems are limited (there is a hand cranked brake that could not possibly be set fast enough, and in a pinch, the operator could throw the car into reverse, but this is very bad for the motors). This was a problem when the Witts (and all other cars of that era) operated, and it was the PCC that introduced the track brake to Toronto. I assume then that the TTC restricts its Peter Witt car’s rare public appearances to routes that have no steep grades, such as Queen Street.